Speed hole: (noun) a sometimes superfluous modification where a hole is drilled into an automotive accessory, denoting a sporting aspect in relation to the machine. See also; ‘awesome’. 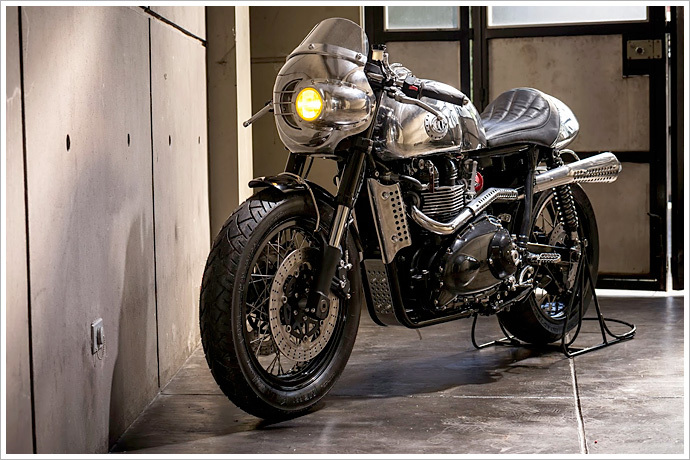 Sometimes a bike appears in the Pipeburn inbox that is truly something special. 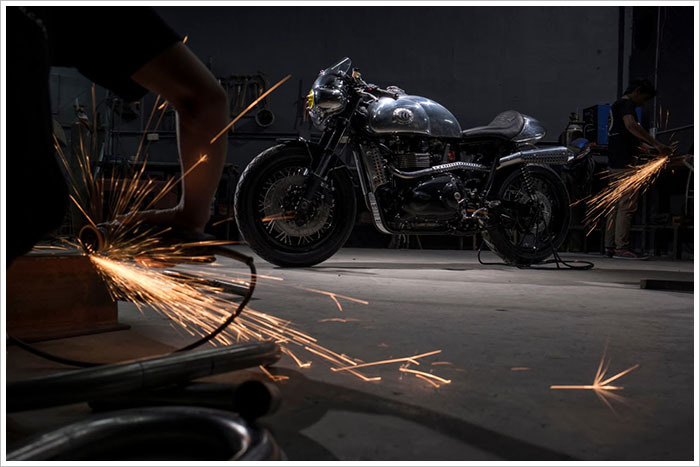 A high level of work, thought, and time, create a truly magnificent motorcycle, the sort of machine that catches your eye and won’t let go. 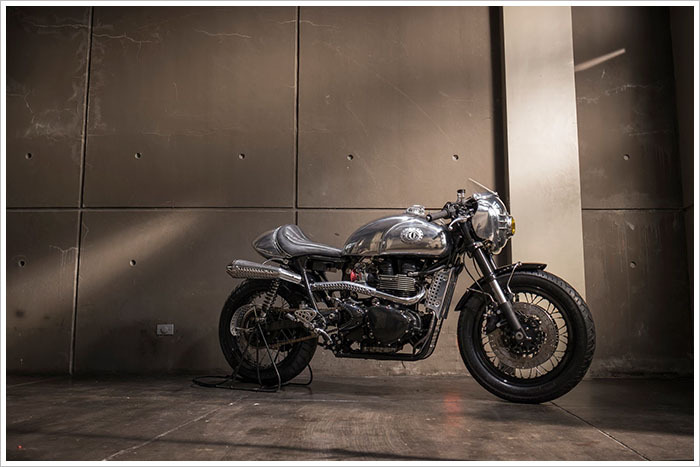 BCR’s latest project, the ‘Steampunk Racer’, is one such bike. 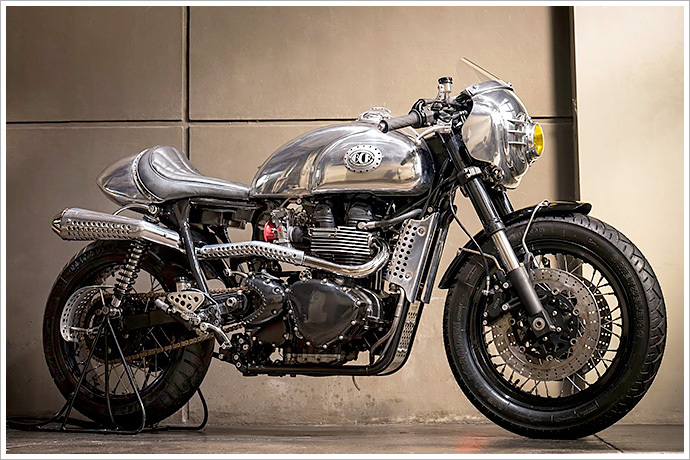 A transformed Triumph Thruxton with a beautiful finish, nicely matched with tasteful performance mods. And speed holes as far as the eye can see. Starting out with a 2008 model Trumpy with 8000 miles on the clock, the BCR crew decided they wanted to build something out of the ordinary. 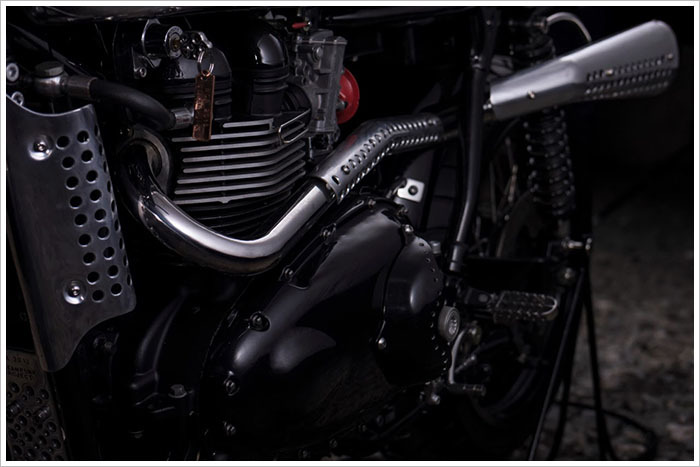 The factory cafe racer was relieved of a good part of it’s aesthetic componentry, and a design brief decided to finish the bike in bare polished and brushed aluminium with jet black highlights. The frame, engine and suspension geometry was to remain as Triumph intended, but the rest would have to be something not seen before. Stripping the front end, the Triumph forks have been replaced by a set from an early 2000s CBR1000RR. In order to accommodate the Honda forkset, BCR fabricated a new steering stem and the steering bearings changed to suit. 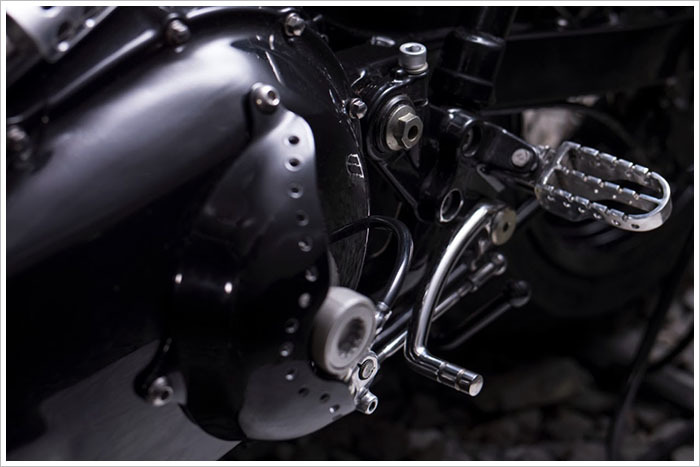 To allow for a spoked front wheel a 40 hole hub from a Harley-Davidson was sourced, a set of axle and spacer adapters machined up in order to keep the front end dual rotor setup. The calipers are the stock CBR units, ensuring no adaptors were required for fitment. Looking now at the upper end of the forks, the top trees were cleaned thoroughly and a set of stainless steel clip-ons were made in house. 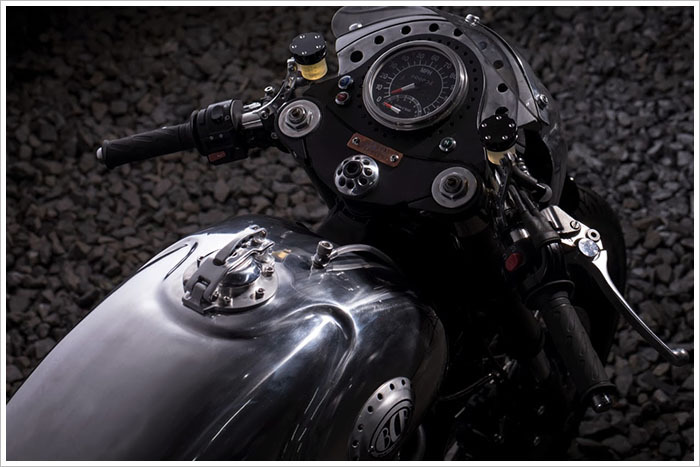 Sitting atop the forks is a custom dash, using a Harley tacho/speedo and keeping the factory warning lights. The dash has been treated to some speed holes to add lightness and cool to the build. The front fenders are fibreglass with stainless steel struts. One of the many highlights on this bike is the aluminium front fairing. BCR didn’t want to take the well travelled road and just put a fairing and a headlight on the front. That would be “too easy”. 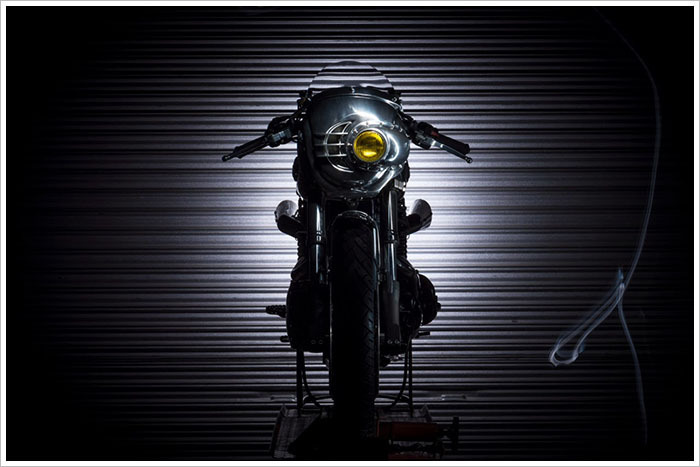 A teardrop bead was used and the yellow headlight offset in the fairing. A panel was hand beaten and used to secure the headlight. In the opposite side to the headlight, louvred have been fitted to keep the voltage rectifier cool under pressure. 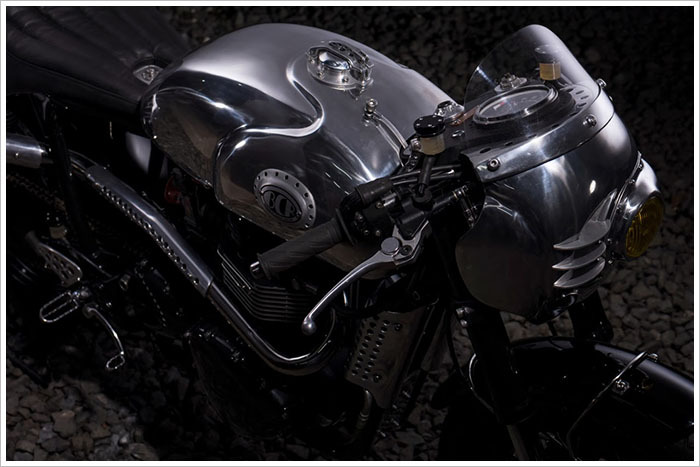 Mounted atop the fairing in a 1/4″ plexiglass windscreen and underneath is covered up by an aluminium panel. Once this was done, it was time to change the hand levers. To eliminate the factory clutch cable setup a hydraulic clutch system was fitted, courtesy of a Ducati 900SS. Using the master and slave cylinder from the Duc, a side cover was fabricated and some speed holes added. To keep with the Italian aesthetic, the brake lever was exchanged again for a 900SS unit and matching brake reservoirs mounted. 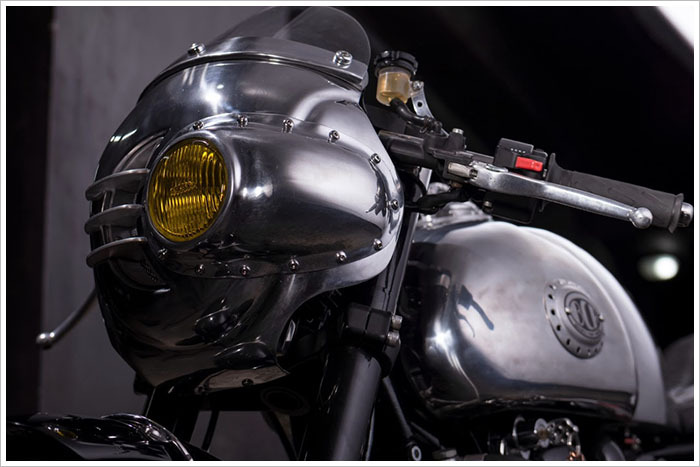 To ensure the bike had an overall look unlike any other, the fuel tank was built from scratch. The main idea was for it to be streamlined and unique. An organic scallop bead was run across the the front of the tank to match the front fairing. 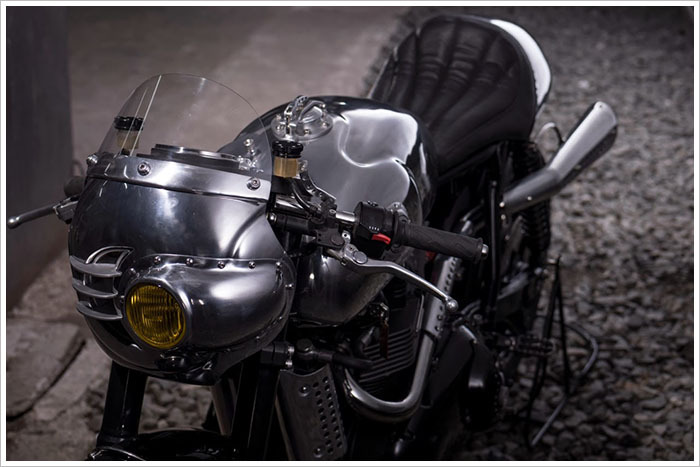 A tank cap was fabricated, and to keep with the raw industrial look of the bike a vent tube was added and exposed. To round out the tank, a hand hammered badge was mounted and speed holes added. Once the tank was made, the next step was to fabricate a new seat and tail assembly. To keep with the lines of the tank, the seat widened the further back it sat. This was also done to keep with the stock wide seat frame and to accommodate the 18 inch 160 profile rear tire. 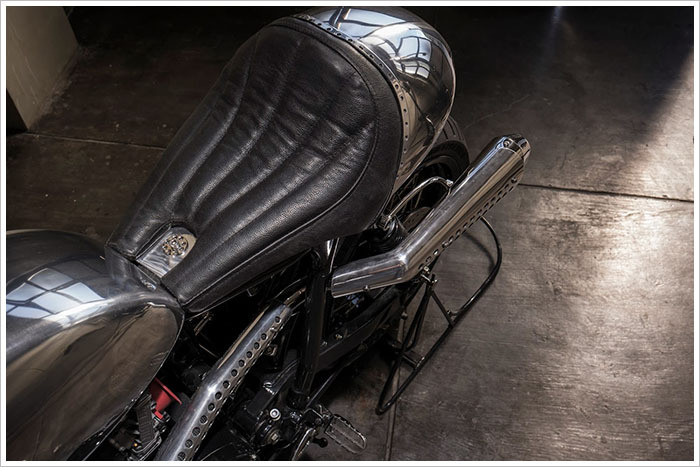 The bottom end of the freshly made ducktail kicks up, mirroring the fairing at the front end of the bike and is split to allow for the large tire. The seat trim is black cowhide with single piping front to back, reinforced by double stitching and piping at the rear. 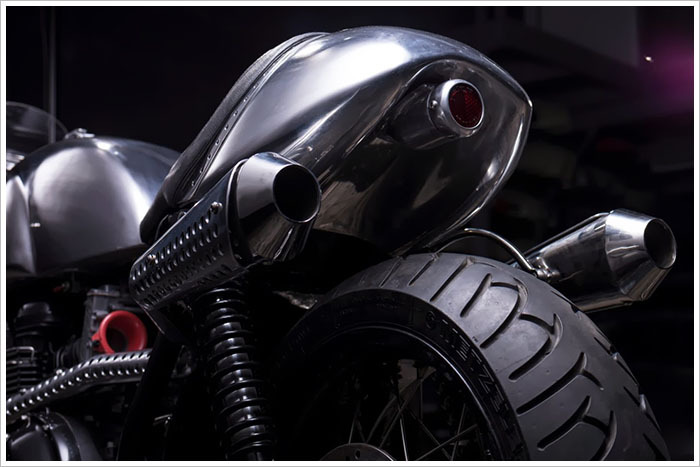 Mounted where the seat and the ducktail meet, a speedholed aluminium strip holds the two materials together. 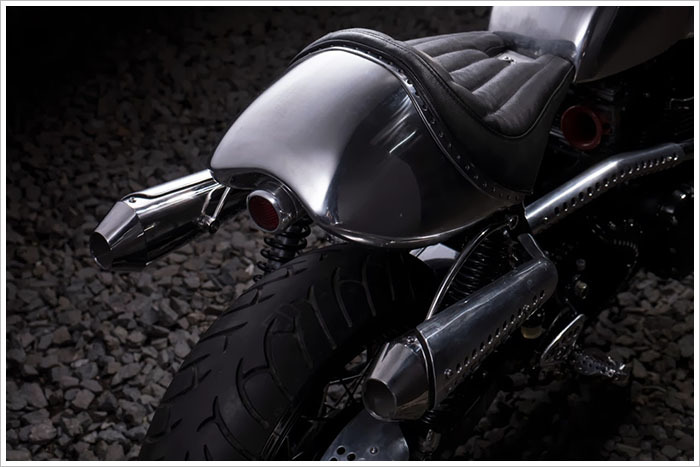 Sitting under the rear end of the bike, the tail light is mounted in aluminium and designed to keep in tune with the headlight. The rear fender is painted jet black, matched with stainless struts again to match the front end of the machine. To keep with the look of the new seat, fenders and tank, a new exhaust system was fashioned up. Starting out high the piping kicks in under the rider, then branching out and culminating in twin reverse megaphone silencers flanking the rear guard. 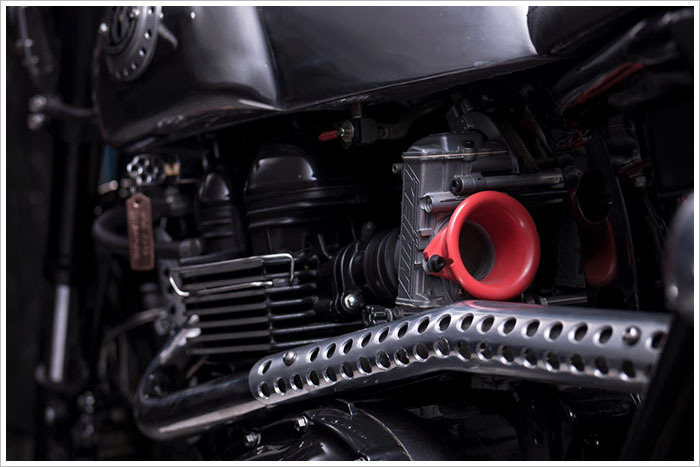 To protect the rider from pipeburn a set of exhaust shields were produced, complete with speedholing. 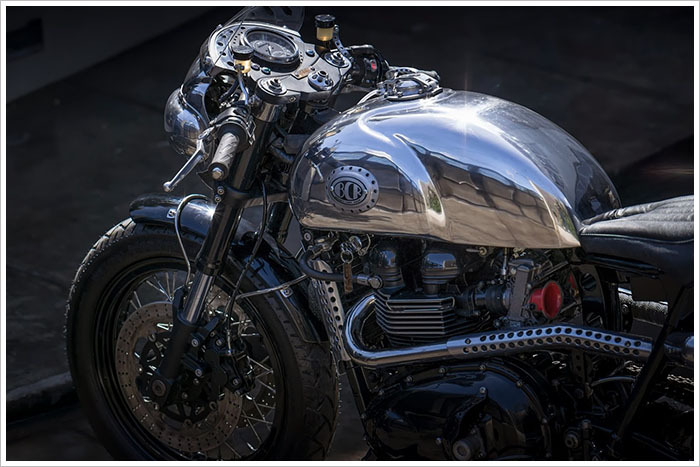 From the front to the back, from the tires up, BCR has gone all out to prove themselves to be one of the top custom bike outfits around. 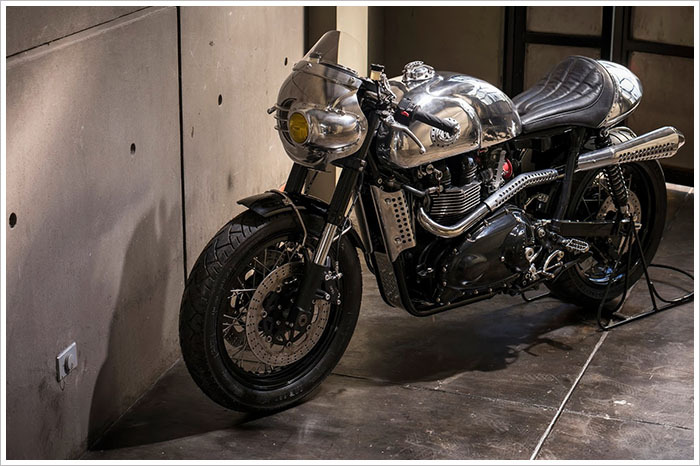 The little touches, the amount of in house fabrication, the speed holes, all add up to this being one of the most unique and beautiful custom bikes to grace the pages of Pipeburn. 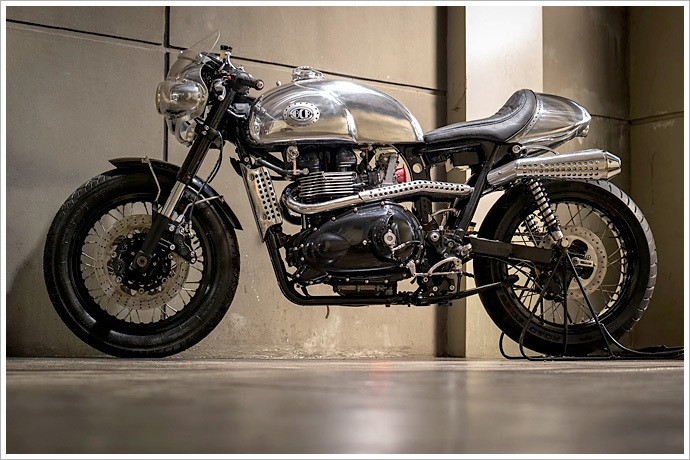 BCR themselves say it best: “We had a lot of fun building this bike. As a company, we wanted to evolve, show people that we could come up with a different look, and that we can go in a different direction when it comes to the overall look and design of a bike. Sure, we could just slap on any of the other parts that we offer, but, again, that would be too easy. We are always up for a challenge and with this build we proved to ourselves that we could do it.” We have to agree.